Responding to increased customer interest in Al Tiramisu's updated celebrity photo wall and web gallery and intense media focus on celebrities at the White House Correspondents’ Association Dinner and pre-and post-parties, Chef-Owner Luigi Diotaiuti debuts a "Superstar Dinner" to mark the restaurant's 16th year in business. 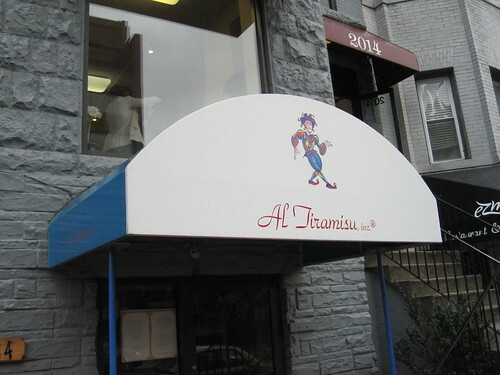 For the first anniversary of Al Tiramisu, the most authentic Italian restaurant in the nation's capital, Chef Luigi created a popular "Big Night" feast from the Italian film by the same name,and long-term patrons have been urging the chef to create other special dinners. "So," relates Chef Luigi, "I thought about customer questions, like: 'What did the Prime Minister of Italy eat?' 'What did various celebrities eat?' 'Can we have a similar dinner for special occasions?' and 'My girlfriend is such a fan of George Clooney. She would be so impressed if I proposed to her over a dinner he ate here.' "And, I realize everyone wants the opportunity to dine like a superstar," concludes the gregarious Italian chef who talks with his hands. Actually, "Clooney-mania" was the impetus for increased customer questions which spurred the idea for the new dinner offering. Media went into overdrive with two spring visits to DC by handsome actor director George Clooney for the late April black-tie White House Correspondents' Association Dinner and multiple March commitments. Paparazzi and media covered his every March move—testifying before Congress on a humanitarian crisis, dining next to First Lady Michelle Obama at the White House official dinner for British Prime Minister David Cameron, and getting handcuffed and arrested by the Secret Service for protesting at the Sudanese embassy. Covering his arrest, media even reported that notorious prankster Clooney identified himself as “Brad Pitt." Clooney did give media the slip for dinner at Al Tiramisu, the cozy, joyful Dupont Circle establishment. Dinner for seven included his parents, journalist father Nick Clooney who got arrested with his son, mom Nina Clooney, and four others. Having dined at Al Tiramisu about 20 times—three times with his parents—Clooney is ensured privacy from patrons though tables are close. He leaves the food and wine selection to chef/ owner Luigi Diotaiuti who describes the superstar as "fun, energetic, and real." The two men share a sense of playfulness and charm. Chef Luigi's guiding philosophy for Al Tiramisu: "I want people to have great food AND a great time." Prix fixe menu per person PLUS tax and gratuity: food only $75; with paired Italian wines to match the food selections, $95—priced in case your earnings don't yet match that of a superstar. A certified Sommelier, Chef Luigi could also recommend exceptional wines of rare vintage ordered by wine connoisseurs and superstars. Phone for "Superstar Dinner" reservations: 202-467-4466. Clooney's March 15 visit to Al Tiramisu wrapped up the end of the restaurant's year-long dual anniversary celebrations for its 15th year and Italy's 150th year as a republic—with cooking classes from the 20 regions of Italy. How appropriate to mark these milestones since Clooney—with his vacation home, Villa Oleandra in Laglio, on the shores of Lake Como in northern Italy—calls Italy his second home.